Today kicks off Blogger's Quilt Festival over at Amy's Creative Side and decided to link up my two favorite finishes from the summer. I am entering this one in the Doll/Mini category. You can read the original post about her here, but in short this was made for my darling little girl for her 3rd birthday. Pattern is free and you can get it here at Sewing Under Rainbow. Finished size: 20 x 20 inches and I pieced and quilted this on my machine. Still deciding which other quilt I will link up and which catergory...so stay tuned! Thanks so much Samantha! I love this pillow and glad it was gifted to my sweet girl - that way if she doesn't appreciate it I can take it back! LOL Thanks for the visit! Thanks so much Billie! :) Have a great day! Thanks Margaret! So glad comments are working again for you! Thanks for dropping by! I love this pillow! 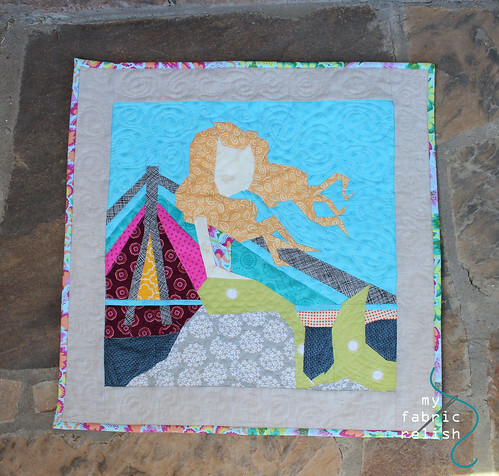 The details of the mermaid are just amazing and you chose the perfect fabrics! Hi again, Kelly! Thanks so much! Im still trying to decide what second quilt I will enter. Thanks for the sweet words and visit! So darn cute! This is one of my favorite pillow covers by far!! Awe, thanks so much! I love looking at all the fabulous entries! Thanks for the visit!! Great job! Your quilting really enhances it. Thank you so much! I really stepped out of my meandering comfort zone for this and do glad I did!! Thanks for coming by to visit!! Looks great - especially the photo of it on the sofa. Lovely colours! Thanks so much, Ruth! It's been a great addition to my little girls reading chair. Thanks so much for visiting! 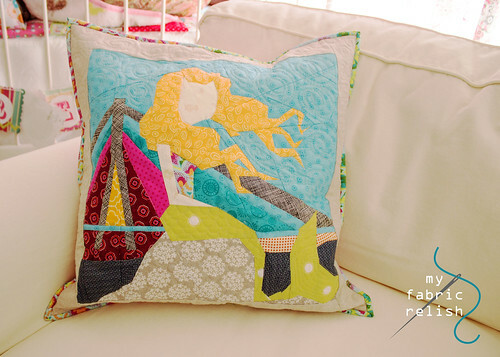 virtual quilting bee blocks...ALL 16!